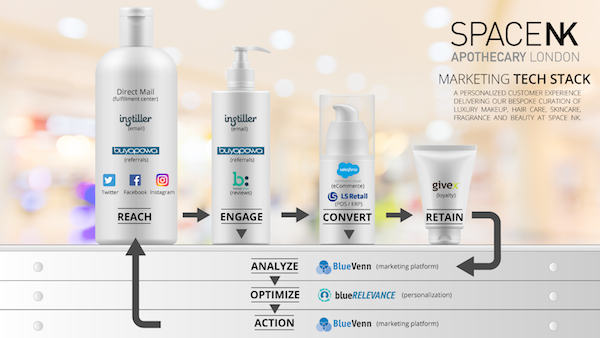 Visualisation of your marketing stack is a valuable exercise for companies – especially those with large and broad marketing activity. 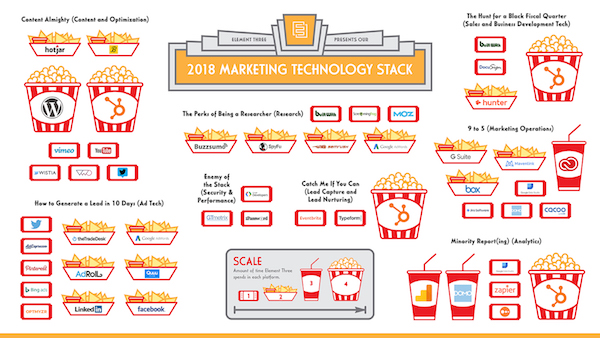 For the uninitiated, a marketing stack is the collection of technology-based tools (or ‘martech’) that marketers use to execute marketing activities. For example SaaS (software as a service) platforms, traditional software, social media tools, CRM and analytics. The purpose is to map tools to activities and allow marketers to check efficiency, overlap and gaps as well as inform planning and implementation. You will already have a stack, you just may not have thought of its elements in this way – or visualised it. The practice of building a marketing stacks lends well to visualisation – as much for fun as navigation and use. This is in evidence by the entrants into the annual Stackies – Marketing Tech Awards for best marketing stack visualisation. What are marketing stacks for? You might also consider organising your stack in relation to a sales journey or campaign cycle. This can make the stack a valuable day-to-day tool for those executing the various aspects of campaigns. Your marketing stack can also help you review costs. What are we spending money on? What does it do? Do we need it? You might find that there are efficiencies to be made due to overlapping solutions. 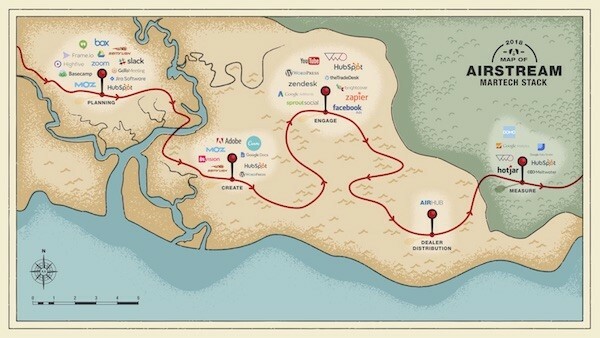 Martech can gather a great deal of valuable data. Would the data from any of your tools be valuable to other teams? What could SEO learn from your Salesforce data? What could your sales reps learn from SEO? 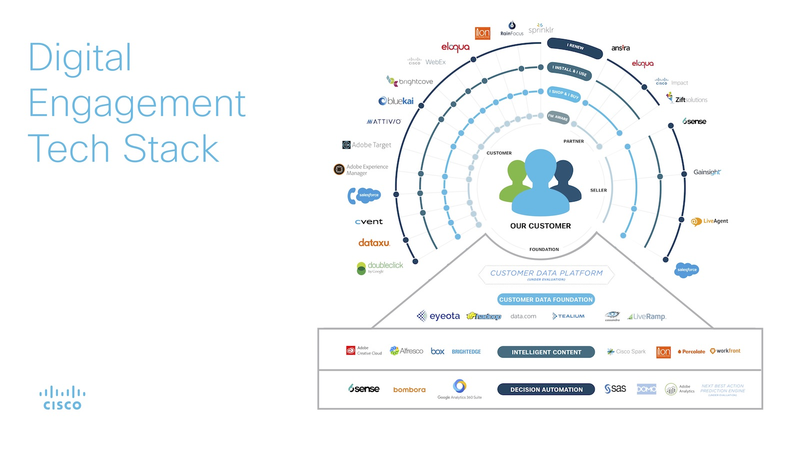 Businesses vary – especially B2B vs B2C – so stacks can also vary as each business type will use different channels and technologies to acquire, convert, and retain customers. As such you may see things in this guide that don’t fit or suit. That’s fine, just tailor your stack for your business and/or industry. Start by listing all of the technology and tools, software and systems that come under each of the headings below. We have included examples of areas and specific tools that this might include. Your list is useful, but to make it more relevant for your company, it can be powerful to personalise it. This can be done with language as well as layout and metaphor. Is there a parallel between what industry you’re in and your stack? For example, if you’re in health and fitness you might map the list onto a body – using organs to describe the various parts: network, the nerves; social media, the mouth; insight, the brain. If you work in the automotive sector you might choose an engine, a whole car or even a race track with all its associated accoutrement. If you can’t think of anything, why not gather the team together for a 10-minute stand-up ideation session? Stacks don’t need a visual metaphor to work well, it can just help engage its users. Many stacks simply organise the tools into a hierarchy for ease of navigation like the Cisco stack. 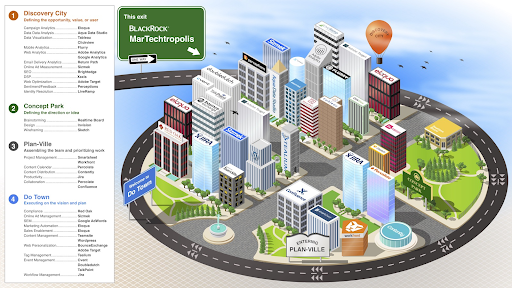 If you have a visual metaphor, the language for sections may present itself, as with the BlackRock stack. For example: if you work in finance and have chosen a bank as your analogy, you might call your content creation list ‘The ATM’ and your social media, ‘the clerks’. A step-by-step guide to creating great logos and brand identities.